Unscrew and remove the engine oil fill cap. 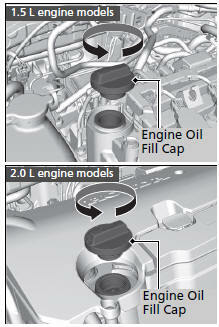 Reinstall the engine oil fill cap, and tighten it securely. Wait for three minutes and recheck the engine oil dipstick. NOTICE Do not fill the engine oil above the upper mark. If any oil spills, wipe it away immediately. Spilled oil may damage the engine compartment components.